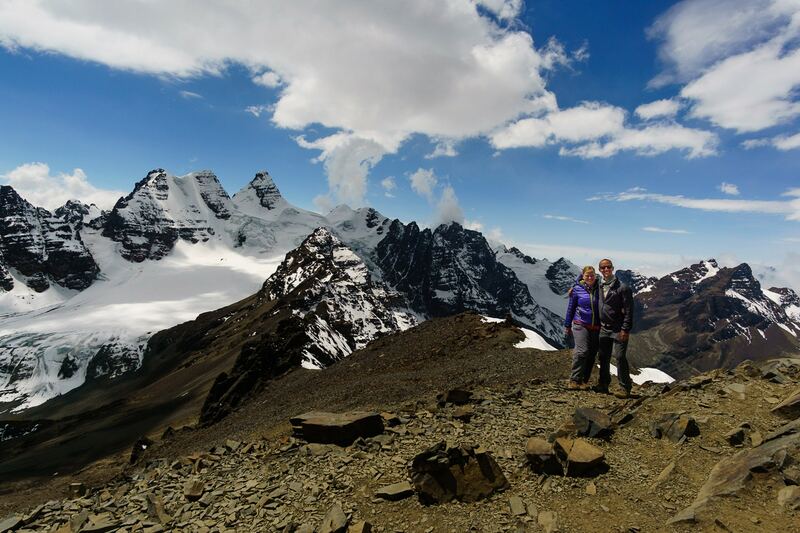 While there are options ranging from a day hike to the full 17-20 day TransCordillera trek, we booked a guided 8 day trek through the range that cumulated with summiting Huayna Potosi at 6088m (19,9974 feet) with a local tour operator. It was one of our most memorable experiences so far during our 14 month trip around the world. Having hiked extensively in Peru in Huaraz, completing the Salkantay Trek to Machu Picchu, and exploring Colca Canyon, we were primed for a longer backpacking trip and to attempt to reach our highest elevation yet. 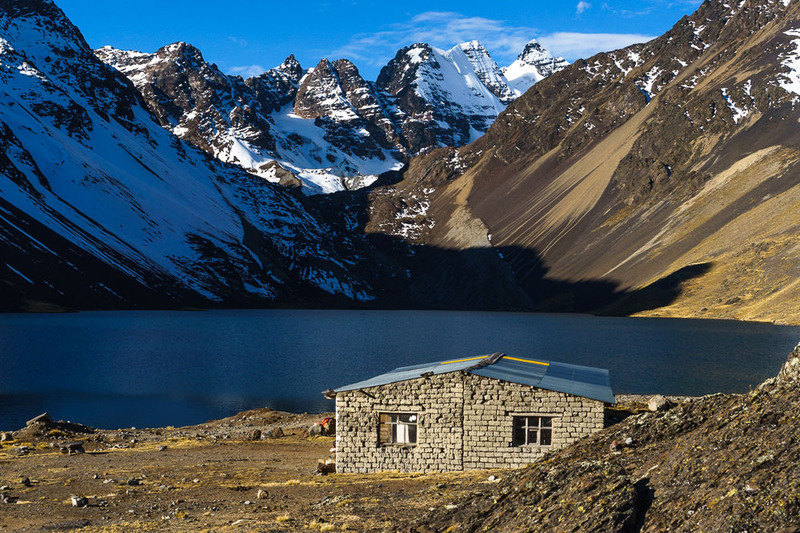 The Cordillera Real delivered not only breathtakingly beautiful views, but also afforded us a degree of solitude not experienced elsewhere during our six months in South America. For many days on the trail, it was just us our guide, and maybe the occasional llama farmer. Bliss. All that said, we still had a number of questions that we asked before starting the trek which we’ll answer here so you can plan your own memorable trip! The first thing we asked ourselves was whether to hike the Cordillera Real guided or DIY. We had originally planned to hike the Colorado Trail in August and Septmember which would have been a fully self-supported adventure, but fires had closed portions of the trail and we were reluctant to leave South America since we had been enjoying ourselves so much. Despite having our hearts set on doing some thru-hiking, we opted to stay in South America and extend our time in Bolivia. It’s such an incredible place and we’re really glad we stayed. That said, we wondered if we could make up the thru-hiking experience with a self-supported TransCordillera trek. We had read about a few people doing it and though we might be up to the challenge. One of the groups did it entirely on their own, and the other carried their own food and gear but paid for a local guide. Our initial research put the cost of a fully guided TransCordillera hike at about $1200-2500usd+ per person which was way out of our price range. 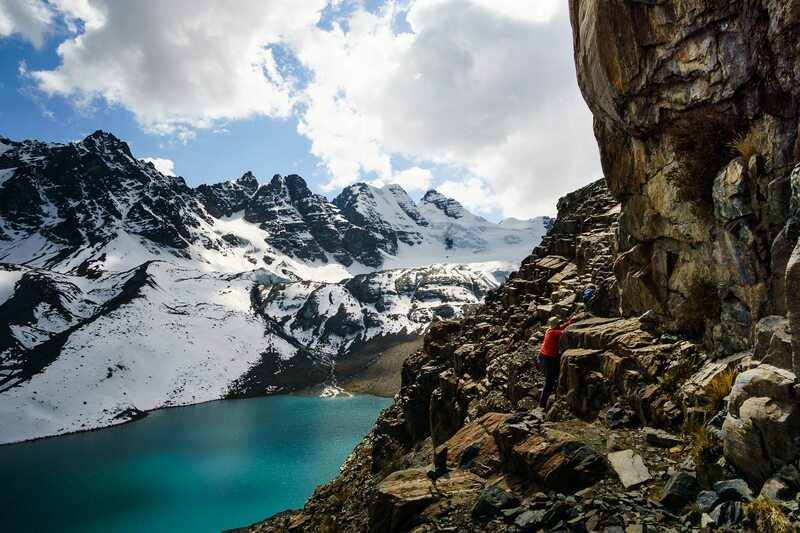 Curious to learn more about a DIY trek, we spoke with Jeff from Climbing South America. His agency would be able to rent us the gear we needed for about $30usd, maps for about 30bs each, and they even had some dehydrated meals they could sell us that would help keep our food weight down. He spent a lot of time going over the route with us in detail which was extremely helpful. The old route, or east side, is currently being bisected by mining roads and increased industrial activity so Climbing South America prefers to guide people along the west route since it’s more tranquil and less developed. That said, the west route is requires difficult route-finding in some parts, being little more than a llama trail and dangerous in the sense that a wrong turn could lead you up to an impassable cliff. If we wanted to carry our own gear and be guided, it would cost about $70 usd per day, still have to purchase our food, and pay for the guide’s food as well. With the DIY option, we would have to arrange our own transportation to and from the trail, which could be anywhere from a few dollars on a public bus to over $100usd for a private hire. So a fully DIY version would cost us at least $600usd plus food for a TransCordillera trek without a Potosi summit. Adding a guided summit, which we felt was necessary since we don’t have a lot of mountaineering experience our own ropes/harnesses etc would cost an additional $150-300usd per person for a 3 day trek depending on which agency we went with. While the price of a DIY trek was appealing, we were fairly intimidated by doing the first couple days of the route where it’s very easy to lose the trail. Mulling all that over, we went and spoke to some local agencies to see what their prices were like. Local agencies tend to cost a lot less than ones with English websites that are owned and/or operated by non-nationals. Often, their gear might not be as shiny and new and the food provided will be very basic, but they’re still generally a great option for more budget-minded travellers. Also, the guides will likely only speak Spanish so if you don’t know any Spanish at all, you may need to pay more for an English-speaking guide. The quotes some local agencies gave us for a fully-guided 14 day TransCordillera hike with a Potosi Summit were about $2000 USD for the two of us. We still felt like that might be too much of a budget buster for us at this price point but the fully DIY version intimidated us with the difficult route-finding, so we opted in the end to do a shorter, guided version with Mountain Guide Juan Alaña’s agency in the La Paz center. We would hike for 5 days in the Cordillera Real beginning at Laguna Khotia before joining the standard 3 day Huayana Potosi summit trip. This was a great way to explore some of the Cordillera Real and ensure that we would be both strong and acclimated for the big summit day. Juan set us up with equipment, warm clothes for the glacier portion, a Spanish-speaking Mountaineering Guide who is his younger brother Ronald, a porter for portions of the trail, transportation, all food for meals, and bookings at refugios for 6000Bs/$865usd for the two of us. Snacks and tips would be optional extras. Given the huge discrepancies in prices between agencies, we asked Jeff what exactly do you get for thousands of dollars more? His take on it was perhaps most importantly for some people, an English-speaking guide, access to nicer refugios (more on the refugios later…) or a high quality tent, and much better food. For us, we eat well enough when we’re not hiking that we felt like a couple days of rice and pasta wouldn’t kill us and our Spanish is good enough to get by most days, so we went for the less expensive option. 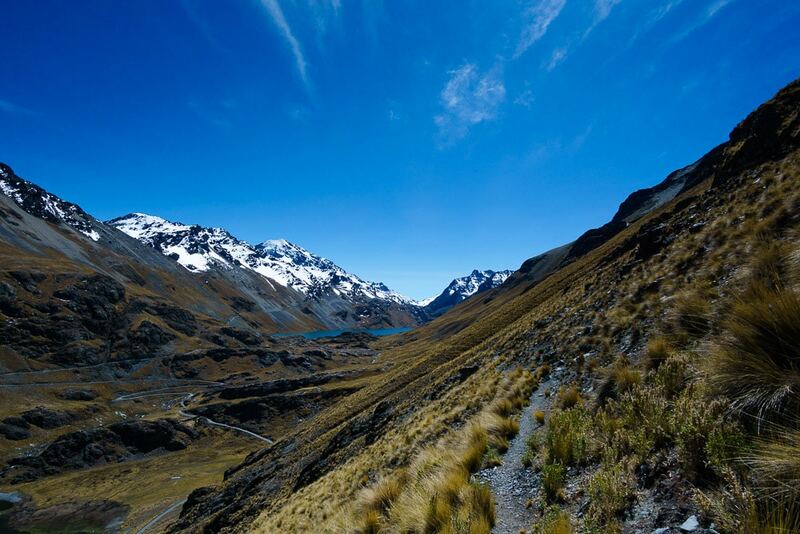 What is Trekking the Cordillera Real like? 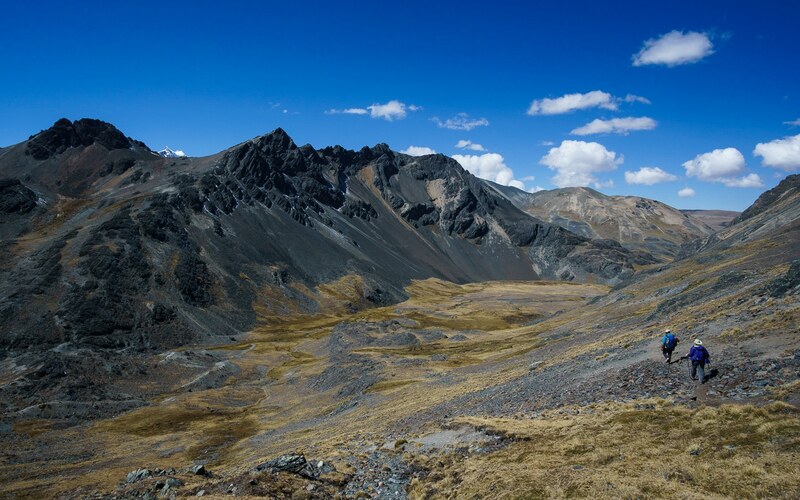 The trek from Laguna Khotia (4750m) to Huayana Potosi base camp is a pretty magical one. 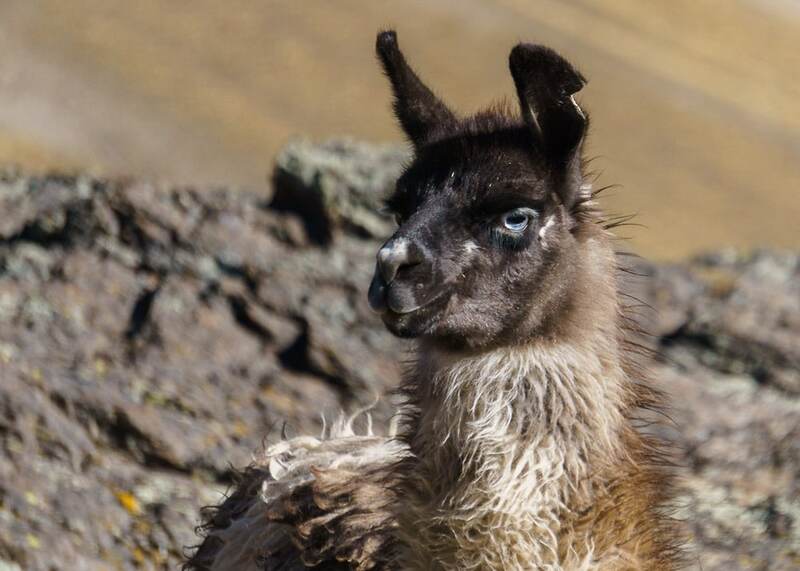 Throughout the trek there are beautiful alpine lakes, sweeping views from the high passes, and chances to see bird life and more llamas and alpacas than you’d ever thought you’d see in your lifetime. On the first day, Lake Titicaca appears off in the distance, as does El Alto from Pico Austria at 5300m. Your objective Huayana Potosi begins as a distant peak before dominating the horizon as you continue to walk closer. For almost the entire trek, we had the trail to ourselves and only ran into other hikers on the 3rd day when we summited Pico Austria, which is a popular day hike from La Paz. On the 4th day, we met a local llama farmer who looked more at home on the mountainside than us in her traditional chola skirt and alpaca wool sweater. She spun a top of alpaca yarn as she chatted with us and enjoyed a good laugh when I tried and failed at keeping it spinning. The elevation along the trail rarely dips below 4500m, so be sure to be well acclimated beforehand but otherwise it mostly just gently rolls along high-elevation passes rarely gaining more than 600m in a day. Most days we hiked between 4-7 hours to reach the next refugio. On the 6th day, you must carry your own bag from the refugio to Huayna Potosi basecamp for about 4 hours. As for going with the local agency, we were very glad we did. My mountaineering boots were a bit sad, but otherwise everything worked well and Ronald was an excellent guide. He was very knowledgeable and made our safety a priority. He was also our chef and prepared a simple but good hot lunch and dinner for us every day. He worked very hard to say the least! The average elevation where we camped was around 4800m, so pretty darned high. Temperatures were around zero Celsius (32f) at night so packing warm clothes, gloves, and a toque/beanie are essential. The refugios along the trail were very rustic, and not in like the charming cabin in the woods way. We’re talking dirt floors, broken windows, uninsulated walls, and just generally unfinished and at times, not very clean. The “beds” in them are frequently nothing but straw packed into a plastic covering and set on the floor. I can’t do straw mats on the floor so I brought my trusty Therma-rest Neo-Air and saved my back. We had to chuckle to ourselves a bit because Ronald kept promising us that “the next one would be better” at every single refugio. That didn’t end up being true until we arrived at Huayna Potosi where the refugios are nice and warm, and the mattresses are plush. A beautiful setting but the refugio was rather rustic. Ironically, the worst refugio was the one from the first night where it looked modern and nice from the outside, but was unfinished and uncared for on the inside. Each room had a bathroom and the beginnings of a shower as well as electric plug ins, so if it was finished it would be a really nice place to stay. Instead, it was filthy with the bathroom overflowing with garbage and the room where we slept had mouse droppings in the corner. It’s important to remember that Bolivia is still a developing country and you can’t expect the same degree of infrastructure that you might find in other parts of the world. It’s also important to remember that this is a backcountry area so you should expect services to be limited and also make an effort not to bring a lot of garbage with you and adhere to Leave No Trace principals. Were we to hike it again, we can’t help but feel like a tent and a high quality sleeping bag may be more comfortable than staying in some of those refugios. 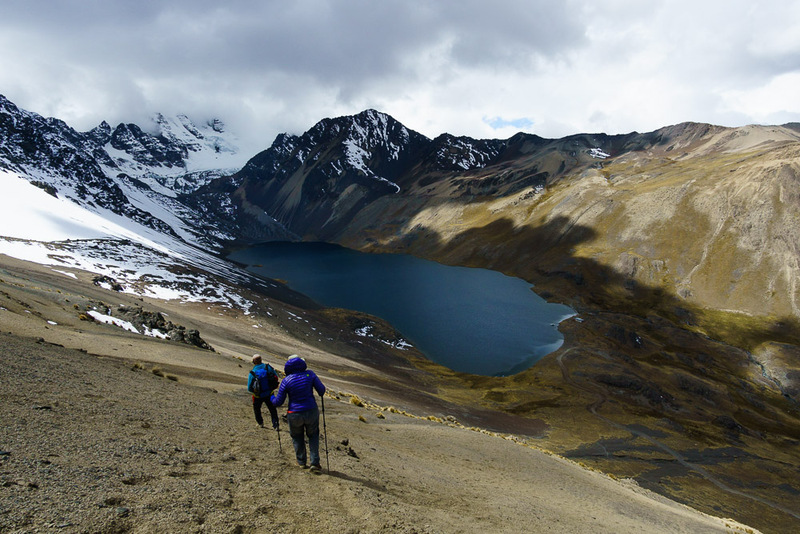 Just like in Huaraz, we’d like to come back with our own gear. The hiking season in the Cordillera Real is generally April to October. We hiked at the end of August and the weather was perfect – mostly sunny days, no rain, and cooler nights. That said, we met a couple who had tried to do some hiking only a couple weeks after us and were told that it was too snowy and they weren’t leading trips, so it’s very weather dependent. 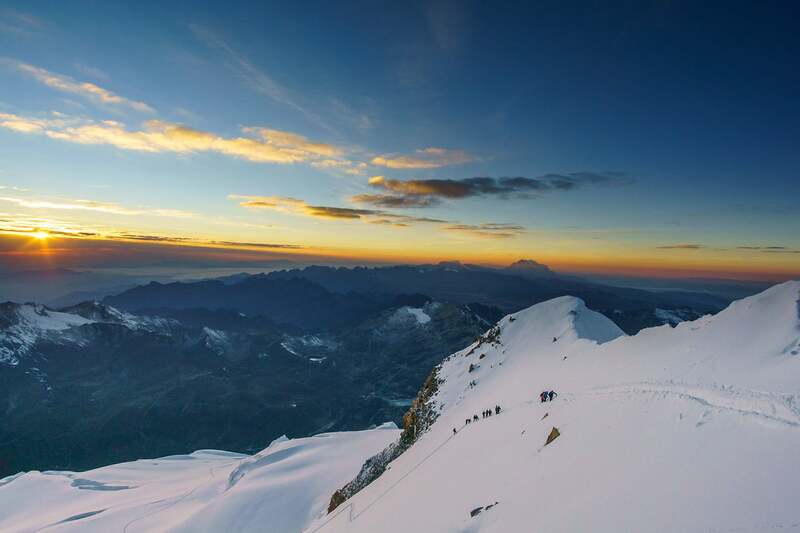 There is a varying range of reports on the difficulty of climbing Huayna Potosi. Some places refer to it as the “easiest 6000m mountain in the world”, other people write as if the entire journey was lifethreatening and they are the most badass daredevils for even trying it. The truth to us, is somewhere in the middle. 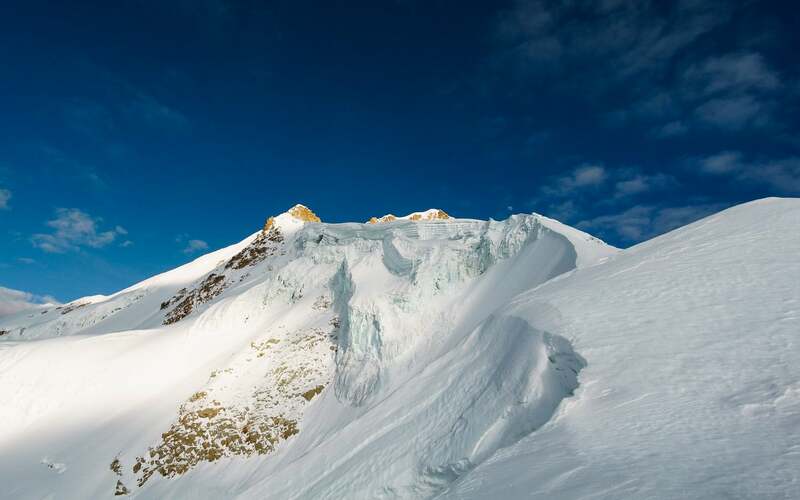 There are no doubt, serious risks involved in climbing Potosi, as glacier travel is always more complicated than straightforward trekking but as far as high altitude climbing goes, this is a pretty simple summit. Acute Mountain Sickness, or altitude sickness, is a risk here and the only cure if it’s a serious case is to descend. Coca leaves can help relieve the headache and give you some energy. To that end, we carried a thermos of coca leaf tea during our summit attempt, but they do not cure altitude sickness despite what you may hear people say. If your condition is worsening as you climb, you have to go down. It can be fatal to keep climbing. 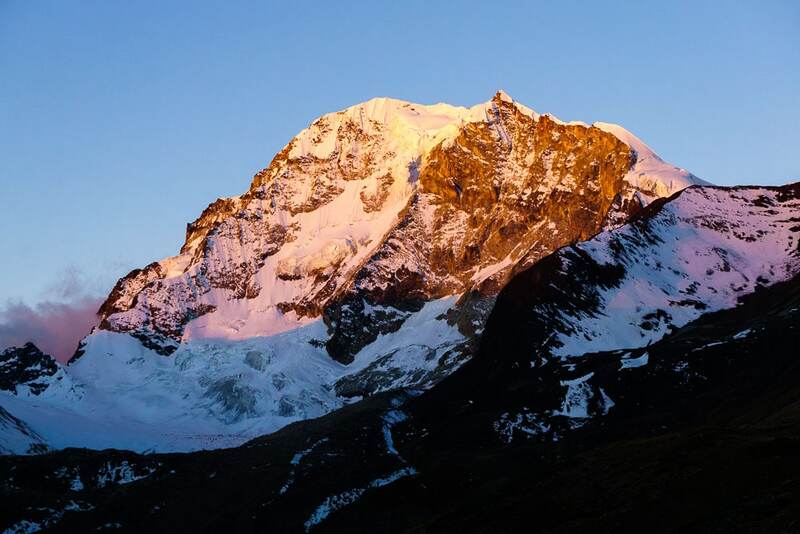 Talk to your guide and you may be able to spend an extra night at High Camp and try again once you’re more acclimatised for an additional fee. There are small crevasses to navigate but nothing too serious. For the most part, as long as you’re wearing crampons and roped in, you should make it up the popular route without issues. Most fatalities on the mountain occur on the French route when people are climbing unguided. We passed a lot of people along the way and many didn’t end up making it to the top. The most technical part of the climb involves moving across some rocks on a steeper part of the mountain. I had very old, not very well-fitting mountaineering boots on and slipped a little on this part but Ronald tightened the ropes pretty much immediately and I was fine. After that, it’s the corniced ridge that could be dangerous. The path to the top cuts much below it but I could see an unexperienced person getting too close to it. Once on the summit, our guide and only one other drilled a bolt into the rock and clipped us to it. Many other people were walking around on the small summit without that added protection from falling. You would have to be pretty careless to fall, but we have all heard of those people, experienced or not, who have fallen to their deaths for a selfie. 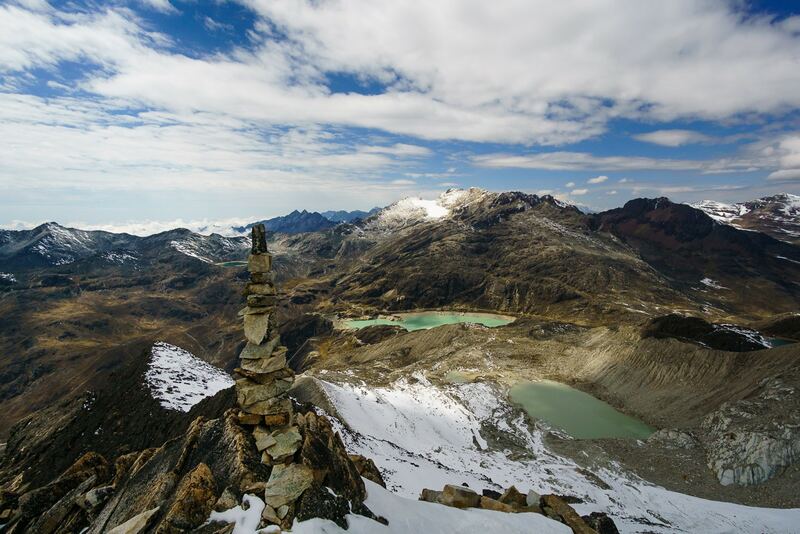 If you are simply doing the 3 day trek to Huayna Potosi from La Paz, you will drive to base camp at 4750m. Once at base camp, you have the option of relaxing or hiking up to a nearby glacier to try out the equipment and give ice-climbing a shot. 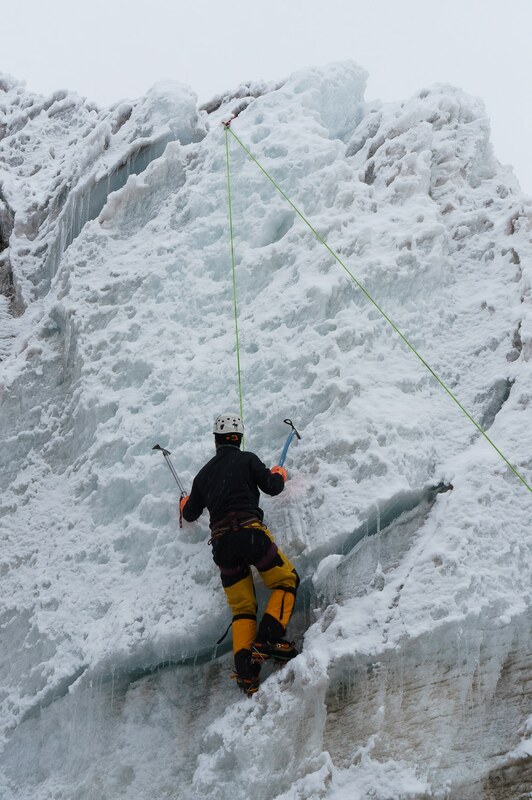 You won’t need to ice-climb to reach the summit so it’s purely just for fun, but we do recommend at least trying on the crampons and getting used to walking with the ice axe and ropes. For 2nd (or 7th) day, you take an easy stroll from base camp to high camp at around 5200m. I say around because there are a few refugios between 5100m and 5300m and where you stay will depend on which one your agency works with. The trail was pretty straight forward until the ranger hut where it starts to climb a bit more steadily and lose rocks and snow make the trip more challenging. This year in particular had been very snowy in the Cordillera Real which made some of the higher parts of the trail snow-covered. Keep in mind that if it’s raining in La Paz, it will likely be raining on Potosi. Snowfalls of more than 15cm may complicate trip plans by causing avalanche danger. If you do the two day trek, you will go straight to the high camp on day one and then try the summit on day two. 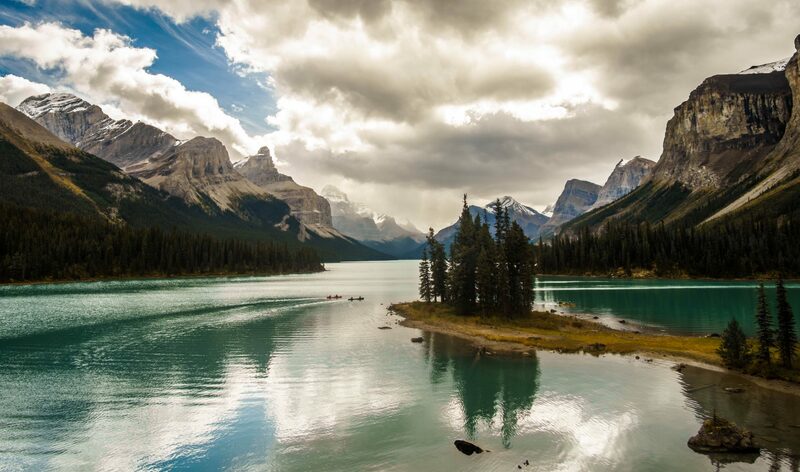 Most of the failed trips we heard about were on the two day trips so it’s likely worth doing the three day unless you are confident that you are fully acclimated. On the 3rd day (our 8th), we woke up at 12:30am, had a small snack and then headed out for the glacier. Poor Ronald struggled with my crampons for about 20 minutes so we didn’t end up leaving until closer to 2am. This complicated his plans to get us to the summit for sunrise. Nevertheless, we walked a slow and steady pace and made it to the summit just shy of 6:30am, in good time for sunrise. As for the walk, it wasn’t as challenging as we thought it would be but I think a lot of that had to do with us being well acclimated and in shape from having hiked so much in the days and months prior. After watching the sunrise over the surrounding peaks and taking our share of the obligatory summit pictures, we started heading down which can be one of the most dangerous parts of the journey since you’ll be tired from the hike up. We took almost as long to get back down to High Camp as we did to get up. 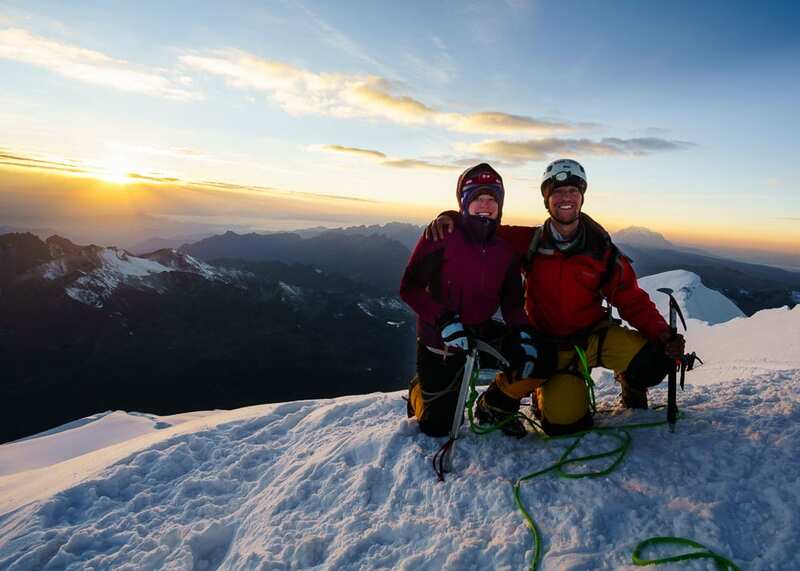 As soon as the sun comes up, it gets really hot on the glacier too so make sure you pack sunscreen and sun glasses. Keep the sunscreen in an inside pocket as mine was frozen solid when I went to use it and I had to wait for it to reheat in my pocket before I could put it on. Once at High Camp, we had a second breakfast of a nice warm soup and tea before continuing on to Base Camp. The hike down to Base Camp proved challenging again at times because of all the mixed rock and snow and I ended up breaking one of Juan’s crampons as well as one of my trekking poles. Nevertheless, we made it in decent time and enjoyed a well-deserved Paceña beer with Ronald. From there, we drove back to La Paz and enjoyed a delicious meal at the Steakhouse. Here’s some things we brought to stay comfortable on the trek. We recommend these for most treks. Hiking poles: They help your balance, take pressure of your precious knees, and help tone your upper body while you walk. Buff: will keep your face and neck warm during windy days and on the glacier. Sunglasses that cover the sides of your eyes: these will block most of the rays bouncing off the glacier and keep blowing snow out of your eyes. Long johns: It gets very cold at night! 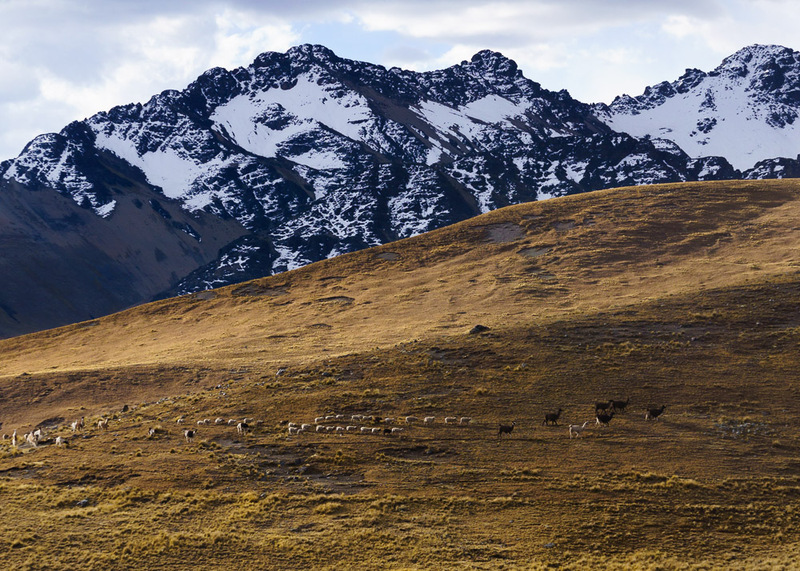 Hopefully we have inspired you to get out and go hiking in the Cordillera Real, the llamas are waiting for you! Thanks for the great read, fantastic trip summary. More pics later please. I want to hike the trail and camp, but I can’t find high-res maps anywhere! Any advice, please? Fantastic information. In your opinion, would these be good enough for attempting the Huayna Potosi summit? Or are specific mountaineering boots mandatory? Those would be great for the hike (as long as they fit well and are broken in beforehand of course!) For the summit you’ll need mountaineering boots that crampons can attach to but most operators provide mountaineering boots and crampons for the summit day. Good luck!